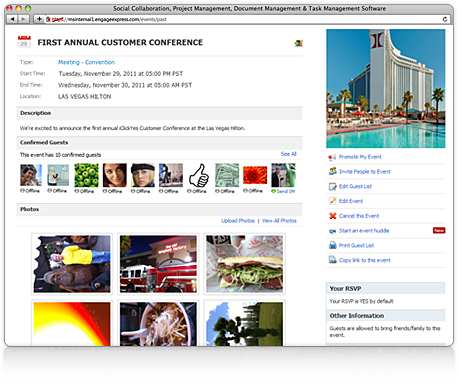 The Social Intranet that combines Social Networking, Knowledge Management & Project Execution in one breakthrough product. 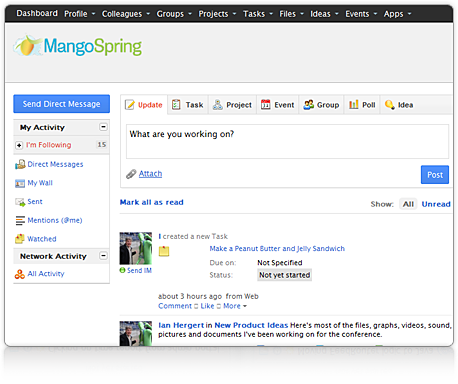 Used by more than 5,000 companies worldwide, MangoApps is the only product that combines Social Networking, Team Collaboration tools and an Intranet to provide a complete collaboration solution for business. MangoApps comes standard with a suite of business applications that seamlessly work together and are available everywhere - web, desktop, mobile & tablets. There are many phones but only iPhone provides the integrated experience that makes it a joy to use. 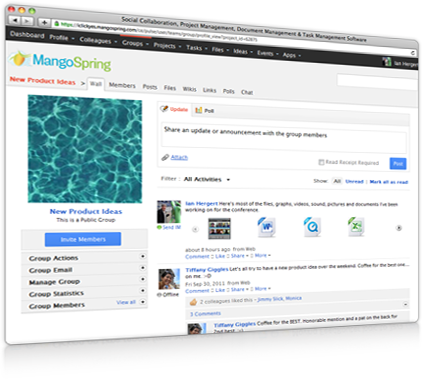 There are many social software solutions, but only MangoApps provides the complete social software experience. With its amazing feature-set, rock-solid security and easy-to-use interfaces, MangoApps is years ahead of any other software solution in the market. 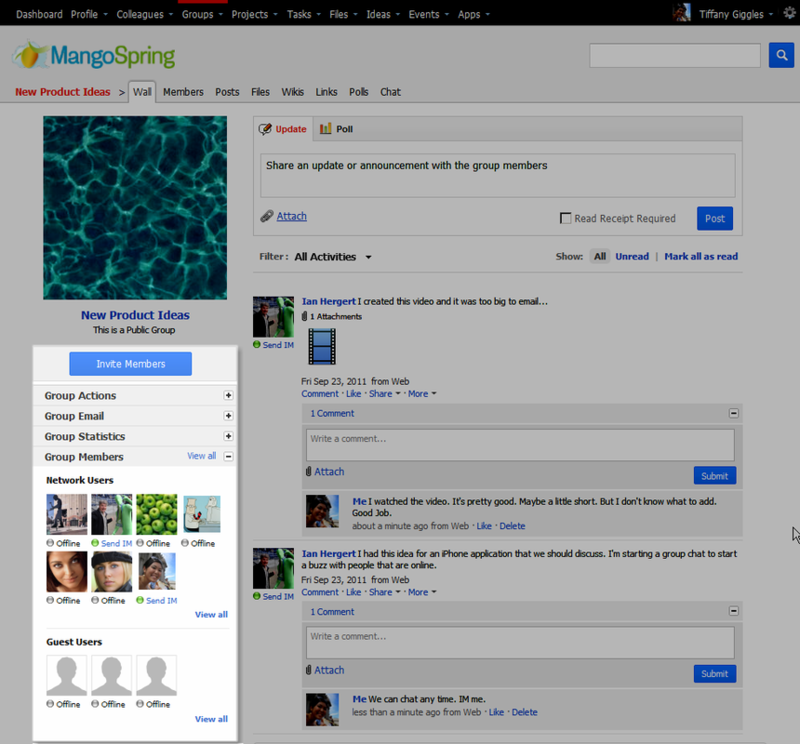 MangoApps is the world's first Social Intranet that combines Social Networking, Knowledge Management & Project Execution in one breakthrough product. 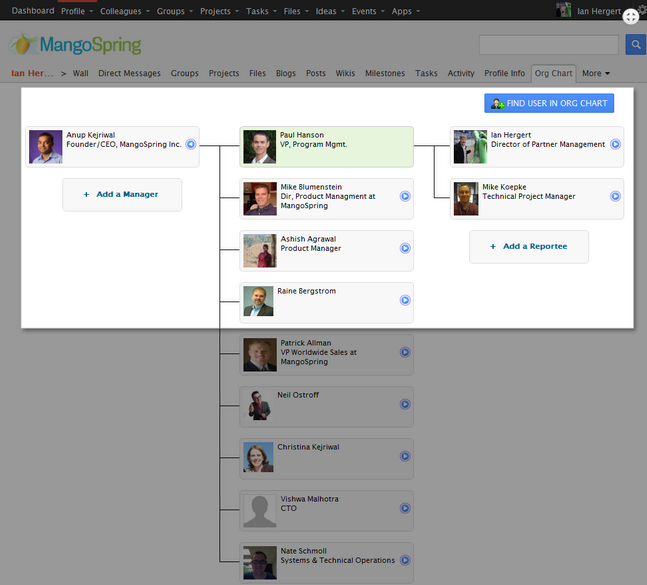 In 2012 MangoApps was selected as one of five Cool Vendors in the Social Software and Collaboration space. Gartner believes that these vendors exist on a backdrop of what they term "the nexus of four IT forces – cloud, social, mobile, and information." 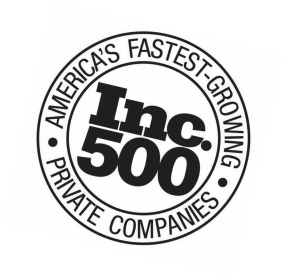 In September 2012 MangoApps made the Inc.500 list of America's fastest growing companies at #163 achieving a startling revenue growth of 2,059% over the previous three years. 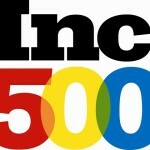 The Inc.500 is an annual list of the 500 fastest-growing private companies in the U.S. produced by Inc. magazine. The list was first created in 1982 and is ranked according to percentage revenue growth over a four year period. Click on screenshots for larger graphics. Start a conversation, create a poll, share news, links, or files. View and reply to posts from coworkers across your organization. 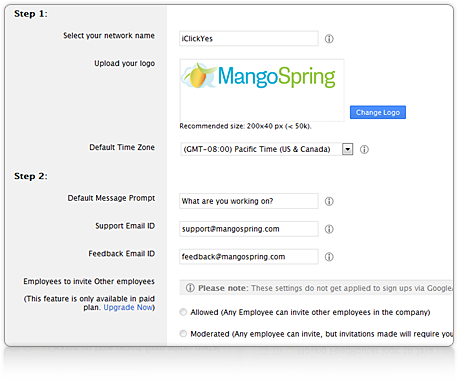 MangoApps provides a seamless integration of real-time presence and instant messaging (IM). 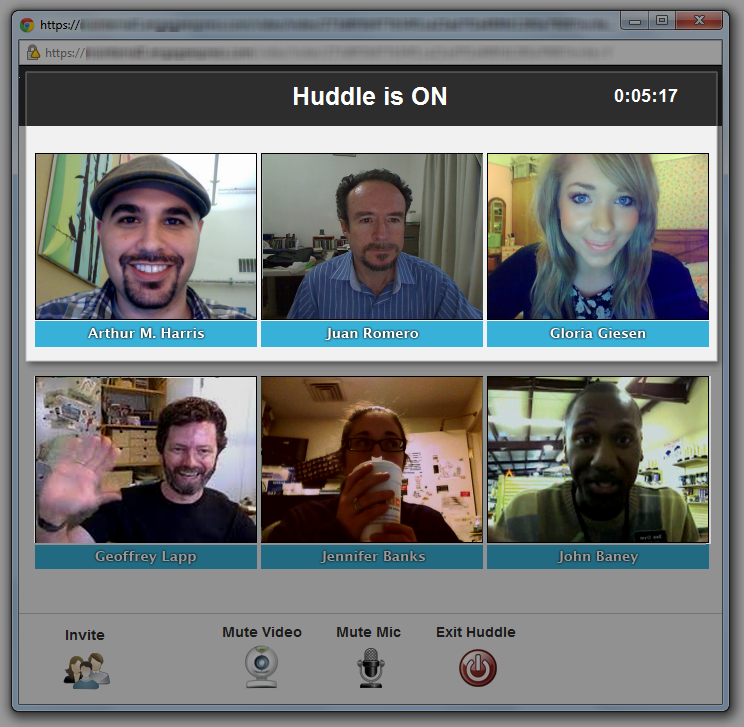 Group chats and video conferencing are a great way to get everyone together in real time. Invite a client, colleague, or vendor to chat, collaborate, and make decisions. Video conferencing with up to 50 participants. 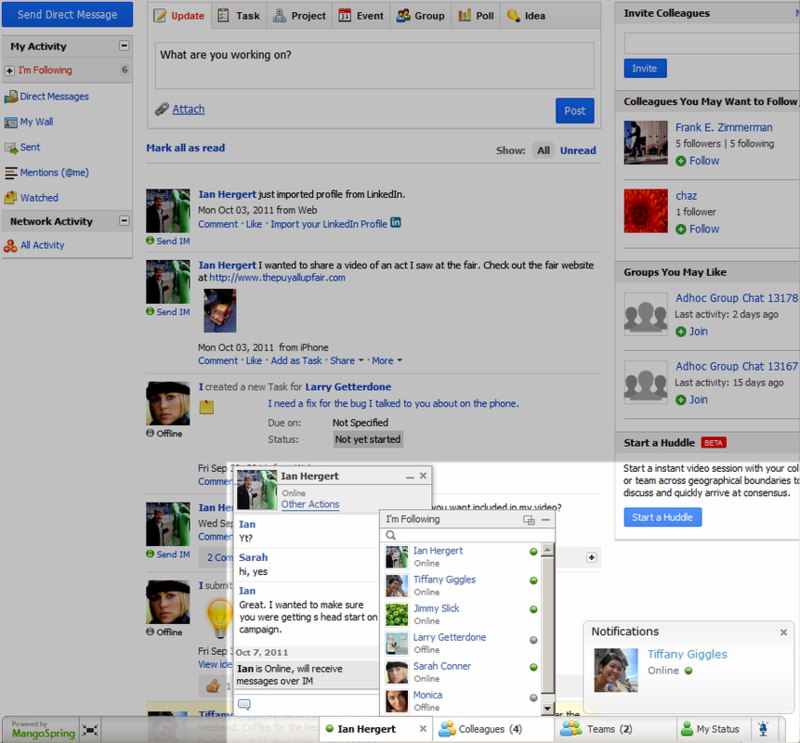 Chat in real time with all project and group members. Group chats are saved and are searchable. Let others learn about your experience and interests. 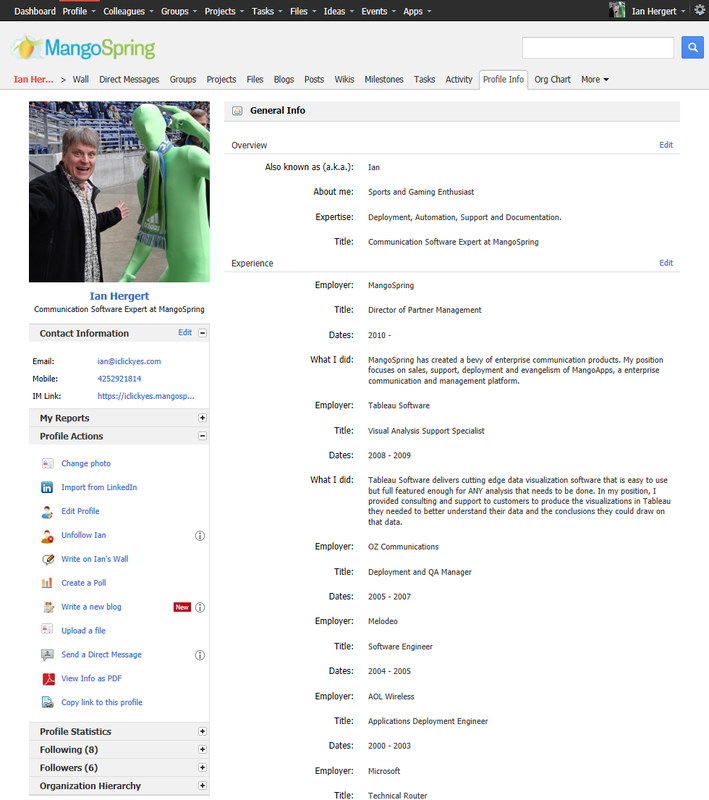 Create a profile that captures your expertise and shows colleagues across the company who you are and what you do. 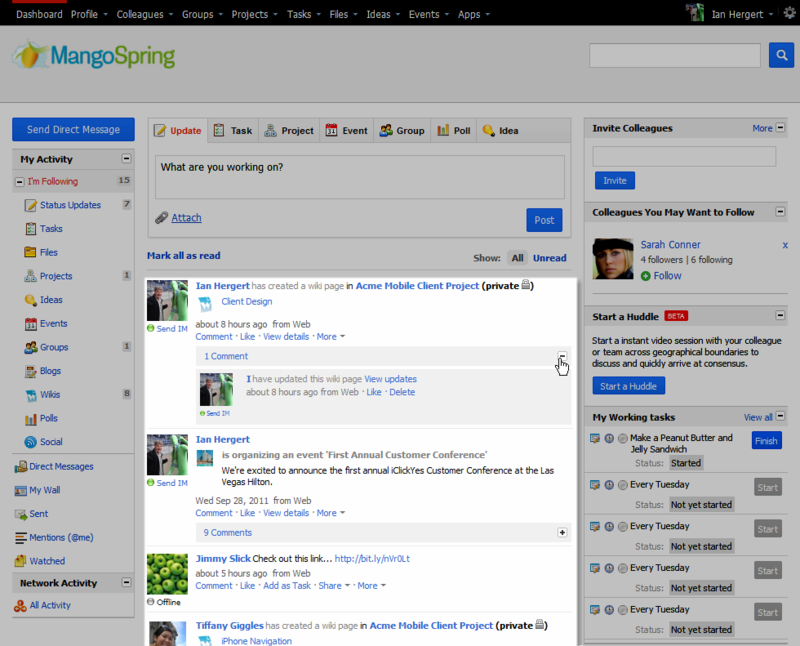 Create and join private or public groups to discuss work-related projects. 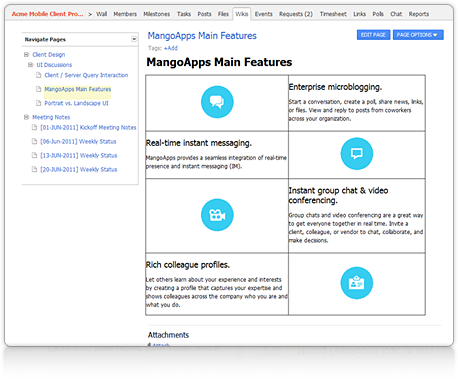 Excellent overview of the MangoApps system, with particular emphasis on MangoTalk and MangoChat. The video is 13 minutes long, but it will give you an excellent grasp of how MangoApps works in the real world. If you are actively considering MangoApps in your organisation, you should watch this video. Secure and easy document collaboration. 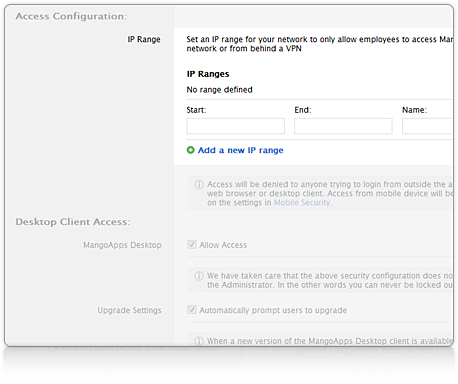 MangoApps is the simplest way to share any size business file from your desktop, browser or mobile. Project Management is all about open communication and collaboration. Keep teams informed, in sync and involved-- in ONE place. 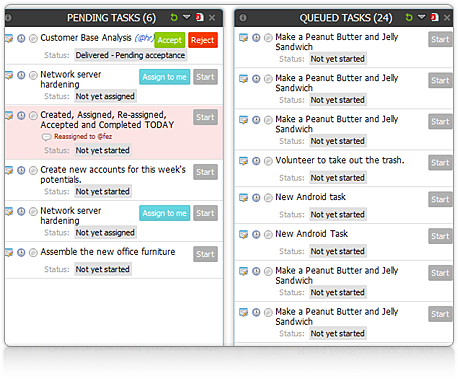 Get organized with the world's first collaborative, lightweight, agile task management tool. Collaborate with vendors, partners, and customers in real time by creating secure, private groups and projects. Anyone can create rich pages and blogs complete with links, images, and more. An engaged guest is a happier guest. Empower attendees to contribute to your company events. Create events from the Dashboard. Activity Streams bring people, process, and application in together in a central, accessible, interface. Updates from things you follow automatically show up in your activity streams. The video is 11 minutes long, but it will give you an excellent grasp of how MangoApps works in the real world. Smart workers want to stay connected wherever business takes them. It's easy with our free apps that let you connect and interact over any mobile platform via your secure and private social network. Privacy and security are the top two top concerns for enterprises. MangoApps addresses these critical needs by ensuring compliance with internal and external regulations. Fully-encrypted database content and passwords. 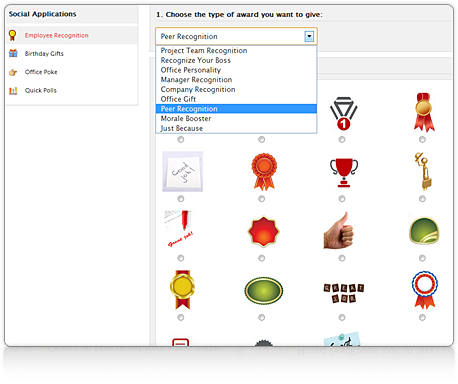 MangoApps comes with a set of social applications like birthday reminders, employee recognition etc. to help create a sense of community and encourage peer acknowledgment. 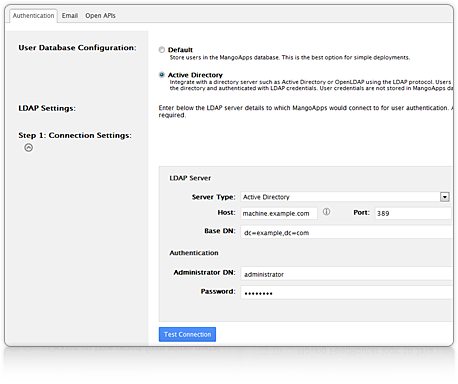 Easily configure and keep your network running smoothly with a suite of premium administrative tools. With offices in opposite time zones, we are uniquely positioned to support your business 24 x 7 x 365 and help you get the most out of MangoApps. When you compare the products, there is really no comparison. Don't be distracted by FUD others try to use to win your business. In the end, no amount of FUD can overshadow the fundamental values we bring to you - passion for building great software that users love and delivering overwhelming value. 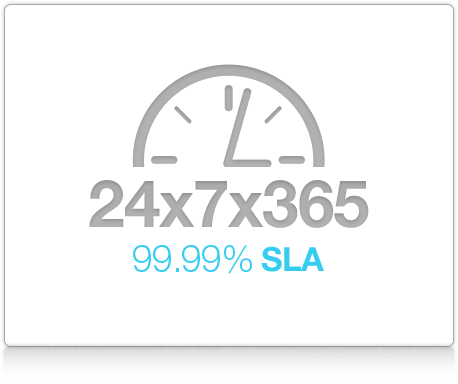 Download the detailed comparison report. 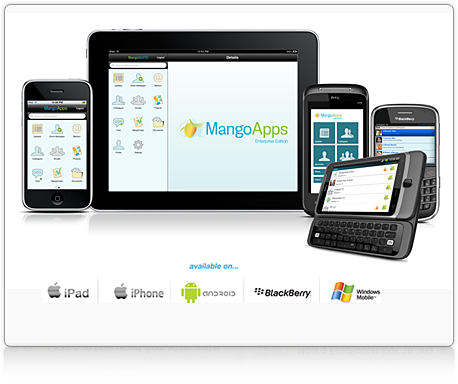 Choose the MangoApps plan that best meets the needs of your business.